On Friday 13 March 2015 Tropical Cyclone Pam hit Vanuatu. With more than 300km per hour winds hitting the islands for most of the night she took everything in her path, leaving behind her a world of destruction and devastation. Included in that was a very remote Primary School with over 100 students enrolled. 11 weeks on now and the children of this school are still not back. Can you imagine your child not being in school for 11 weeks and without an outlook to be back at school for up to a year or more? 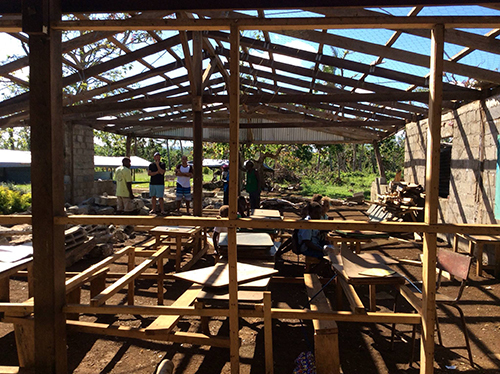 Due to the devastation of gardens, the primary livelihood of the school community, there are no internal funds to support the rebuild of the community school and they are last in the line to receive any international aid. Our project is all about giving this wonderful community a hand up in the face of Mother Natures adversity. With a little bit of your time and the cost of a bought lunch we can Rebuild, Rejuvenate and Educate a community for generations to come. Please give kindly, we appreciate your support. Full version …. 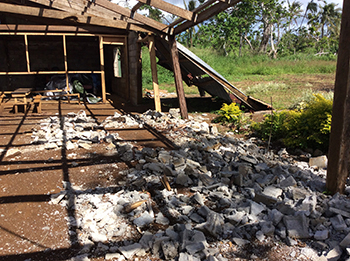 Cyclone Pam hit off the west coast of Efate in the evening of Friday 13 March 2015. Cyclone Pam tore through the 80 islands of Vanuatu, packing wind gusts of up to 320km per hour leveling homes, schools and any building in its path, smashing up boats, destroying roads and bridges, and bringing down power and phone lines. 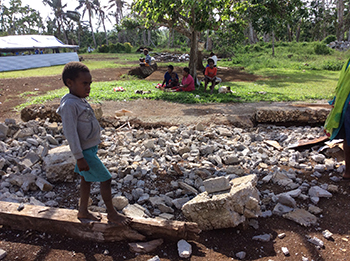 By some miracle nearly everyone in Vanuatu survived the cyclone, but most of the villagers houses and amenities were destroyed. The available water was muddy and unsafe to drink, the village gardens were smashed, and people desperately needed water, first aid and food. Although her own house was badly damaged, one of the local resident’s Sarah, took a look around to see what she could do to help those in need around her. She had access to the family’s truck and decided to use it to help the Pro Med crew via their newly formed ‘RENEGADE AID‘ emergency response unit. Initially their main focus getting supplies and fresh water supplies to the more remote villages. 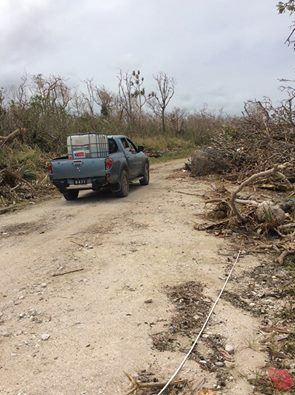 Renegade Aid was established as an emergency group using the good faith of volunteers to assist with immediate and life threatening requirements post Cyclone Pam. They did an amazing job that will never be forgotten and have created a base for any future disaster that will enable immediate relief and support. Throughout the daily trips under the direction of Renegade Aid, Sarah’s truck and the team on board soon became well known in Vanuatu as Lil Blu. Whilst Renegade Aid has disbanded, the generous work of the local ex patriate community, foreign aid, local businesses and the Lil Blu crew continue to help rebuild Vanuatu. As we know most of the people survived…… both through the cyclone and through the critical first few weeks after…and now the REAL task of recovery begins. The recovery that is so important to the future of Vanuatu and its beautiful people. Most of the village people’s houses are still in ruins, the village roads are almost impassable, the village gardens have been devastated and in many cases covered in debris and wreckage that needs to be cleared using chainsaws and other equipment. Many of the hotels and businesses have closed in a country placing further pressure on Vanuatu and its recovery from the aftermath of Cyclone Pam. 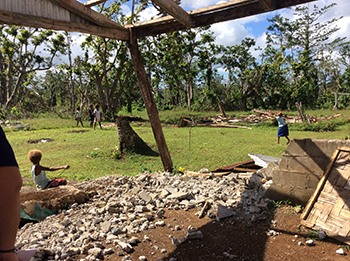 The media coverage stopped relatively soon after Cyclone Pam however the devastation of the night of 13 March 2015 can still be seen everywhere in Vanuatu, many of the buildings remain destroyed, minimal fruit and vegetables are available for sale, unemployment is at an all-time high and aid is not reaching many areas of Vanuatu in need. Lil Blue came across this small school 7km from the main road and 20km from port Vila. It was rendered unusable post cyclone Pam. Although the 120 children started gathering at a central community centre after 7 weeks of no school they still have no stationary, books, classrooms, desks or chairs. We hope to rebuild this lovely little school so that the children of the remote teouma bull, bush and kounsel area can resume their education and growth for the future. The school has no aid and cannot be rebuilt without our help. 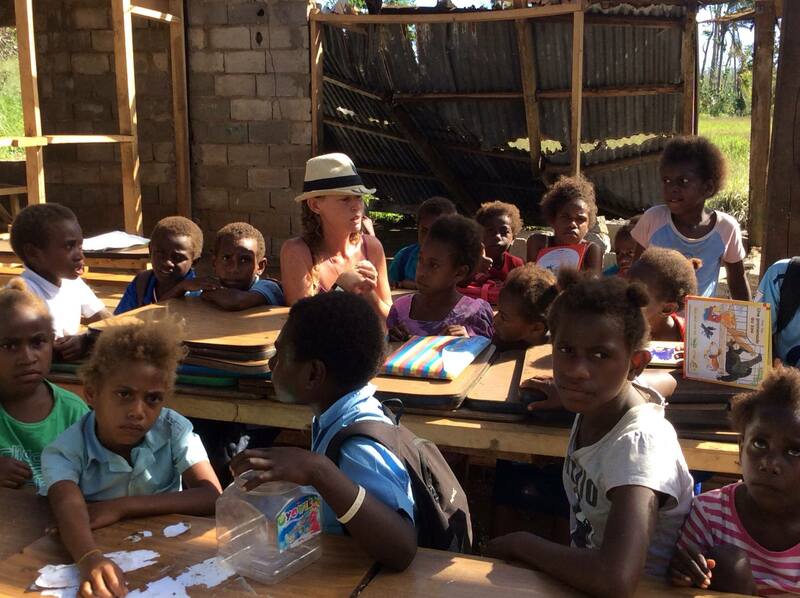 The way that team lil blu has been best able to outline on a physical and emotional scale the devastation of cyclone Pam is through one word. “Powerless” they were powerless to Mother Nature. As Sarah describes “not having control over your decisions, situation, life renders you in the lap of the gods. As our rooves, trees, gardens, homes were ripped and stripped away from us by the sheer force of wind we spent our time focusing on breath and life – ultimate survival instinct we were left to wait, just waiting…….. Powerless to controlling our own lives”. By raising the roof on Kingland school Sarah believes we will be supporting a strong and viable opportunity to allow people who experienced that awful night and the truth of powerlessness to regain, rebuild and re- empower themselves. Education is a great form of power so what better way to start rebuilding for the future, than through children, to win back the power that the people of Vanuatu so truly deserve returned. With Tourism being the main form of income in Vanuatu and so many of the hotels closing down, temporarily or permanently, employment levels and opportunities are limited. Tumbled by Pam will be a not-for-profit workshop where wood that was “tumbled by Pam” can be used effectively to create souvenir items such as chopping boards, cheese boards, bottle openers, coasters, place mats and simple wooden toys. There will be an open door policy on employment. Volunteers can join for a day or as many days as they like. Each piece created will hold the genuine thumb print of the carver and a tag with their name.